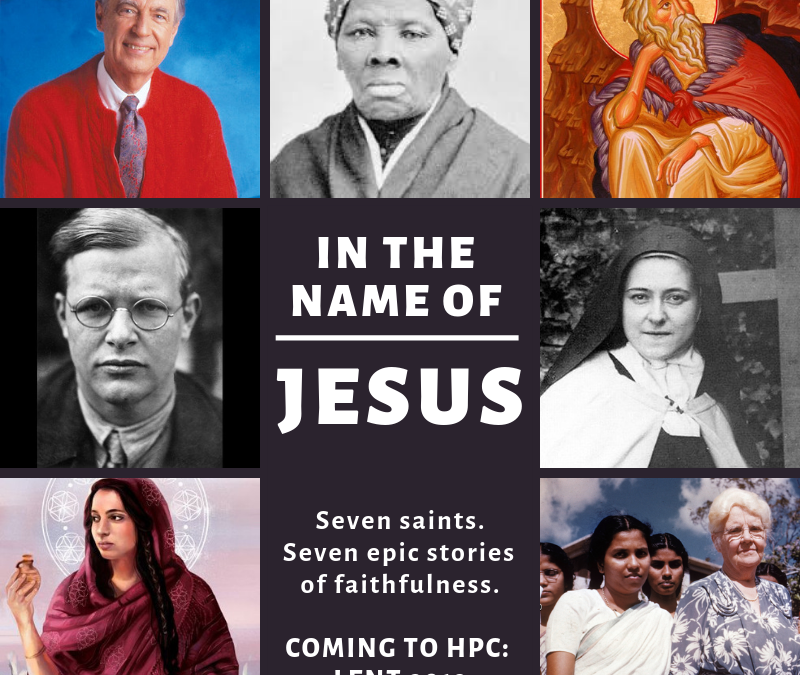 We continue this morning in our series called In The Name of Jesus, telling the stories of seven faithful people who came before us – each of whom followed Jesus in their own very particular way. We’ve already heard the stories of Fred Rogers, Harriet Tubman, and the Prophet Elijah, but today I want to introduce you to a new companion on this journey: St. Therese of Lisieux. St. Therese was a French nun of the Carmelite order who lived at the end of the 19th century, which is not remarkable in and of itself. But it was the way she chose to live that offers us a glimpse of something significant and extraordinary. But first, we’re going to hear part of Paul’s letter to the Philippians, which describes St. Therese quite well. Therese’s story begins long before she even entered the world, with her parents: Zelie and Louis Martin. Zelie and Louis were both faithful Roman Catholics who grew up in different parts of France – and each of them, at different points, had tried to enter a religious order themselves. Zelie wanted to serve the sick, but was turned away, and Martin was turned away when he tried to enter the priesthood because he didn’t know enough Latin. Both of them went away saddened and troubled, until they met one another and decided they would marry and raise a family together. Born on January 2, 1873, Marie Francoise-Therese Martin was the youngest of nine children, only five of whom survived into adulthood – all girls. Therese was especially spoiled by both of her parents—her father called her his ‘little queen,’ and she was very extroverted and precocious and stubborn, always seeking the attention and adoration of the adults and older children around her. She was also, along with her whole family, very pious: she would immediately admit anything she did wrong, and she and her sisters prayed together as often as they played together. When Therese was about 4, one of her older sisters decided she was too old to play with dolls, and came to Therese and her sister Celine with a basket filled with a doll and doll clothes and other such things and said ‘these are for you – choose what you would like.’ Celine chose a ball of wool that she liked very much, and then Therese looked at the basket, thought for a moment, and said “I choose all.” She carried off the whole basket, and that was that. Later, she would apply this same logic to her whole life: whatever God asked of her, whether it brought suffering or joy, whether it was difficult or easy, she wanted it all. Unfortunately, Therese’s mother died when she was only four years old of complications from cancer – and this changed little Therese’s life dramatically. Once so talkative and enthusiastic, she became withdrawn and anxious, content only to spend her time with her closest family. This continued until she was a teenager, though she soaked up quite willingly every ounce of love and tenderness that her family offered – especially her Father, her second-oldest sister Pauline, and after her father moved the family to Lisieux to be closer to family, her cousins Marie and Jeanne. Therese continued to grow, in body, mind, and spirit – she began attending school at the local Abbey when she was eight, where she excelled academically, but continued to struggle socially. When she was 9, she confided to Pauline that she wished to be a hermit, and go away to a desert place (but with Pauline) to be alone with God and to pray and study. Pauline said she, too, wanted this – but she was waiting for Therese to be old enough for her to leave. That same year, Pauline did leave. She entered the Carmelite convent in Lisieux, which was a cloistered order of nuns dedicated to prayer. Side note: there are many orders of religious men and women in the Roman Catholic church, and each one has its own rule and way of life: some are dedicated to service in a particular community, some are dedicated to study, and some are cloistered – which means that life is primarily solitary, and those who enter these orders do not leave the confines of their convent. The Carmelite order was and is structured this way, which meant few visits even with family – and long days of silence broken only by prayer and a couple of hours for work and recreation. So when Pauline told Therese of her plan, she was both delighted for her sister and absolutely heartbroken. But as Pauline described life in The Carmel, as they called it, Therese also felt called to pursue this life – not only because her beloved sister would be there, but because she felt certain that the Holy Spirit was pulling her in that direction. Pauline set up a meeting with the Prioress, who led the convent, and Therese explained her call in great detail. The Prioress explained, though, that she may very well be called – but they did not accept anyone at the age of nine. She would have to wait until she was sixteen to begin the process. Therese was devastated – not only to lose her sister, but to be told to ‘wait.’ After Pauline entered the convent, Therese became gravely ill – it’s thought partially due to a nervous breakdown, though there may also have been an infection that exacerbated her symptoms. She spent much of the next year in bed, and no one knew if she would recover at all. But at one point, she was moved to her sister Marie’s room, where there was a statue of the Virgin Mary – and Marie and Therese were both praying when Therese saw Mary smile at her: a radiant, beautiful smile. Suddenly, two tears of joy dripped down her face, and she was well again. After her miracle, she was well enough to go see Pauline take her final vows to become a nun, and the rest of the women there fawned greatly over her because of course Marie had told them all the story. Some time later, Marie would leave for The Carmel as well, and her middle sister Leonie would leave to join the Sisters of the Visitation – a different religious order. This left only Therese and Celine at home with their father, and Therese continued to express a desire to join The Carmel as soon as possible. At age fifteen, she convinced her father and then her uncle that she was ready, before she was told that the Superior of the Carmelites—the head of the order—would not allow her to enter until she was twenty-one unless she had permission from the Bishop. Again devastated, her father offered to take her to see the bishop in a nearby city, which they did. Therese explained again her desire to join the nuns there and the Superior’s decision, and casually mentioned that she and her father and her sister were going on a pilgrimage to Italy soon. The Bishop said he would talk to the Superior, and certainly she would have the answer while she was in Italy, because his assistant was also going – and so she left without any concrete answers. Among the historical sites like the Coliseum, the group was also granted an audience with Pope Leo XIII in honor of his jubilee – his tenth year as Pope. Therese still had no answer from the Bishop, and so she was determined to get permission from the Pope himself. On that day, they celebrated mass first before each person met privately with him. Before Therese’s turn, however, the Bishop’s assistant loudly announced that he absolutely forbade anyone to speak during their audience. Therese’s heart started beating fast, and she turned to her sister and asked what she should do. “Speak!” Celine said. Again, with no concrete answers or decisions, Therese was guided away to rejoin the group. After they returned home, she still had no answer – until she received word on New Year’s Day 1888 that the Bishop had granted her request, but the Prioress (who was now her sister Pauline) would not allow her to enter until after Lent. Disappointed and overjoyed at the same time, Therese used those months to grow intentionally in maturity and patience. She once wrote to a novice that she sometimes fell asleep during prayer and felt horrible about it, until she remembered that a parent loves a child just as much when they are asleep as when they are awake – and so even when she was asleep, God looked at her with just as much love as that good parent. Therese lived in the Carmel at Lisieux for just over eight years – and during that time, her father died and her sister Celine came to join her there, which means that all five Martin sisters entered convents, and four of them lived and served together at the Carmel. We have so many of Therese’s writings because while she was bedridden with an infection during her last year or so of life, her sisters asked her to write down her story and share her rich inner life. After she died at age 24, her writings were published and she became a widely-read theologian almost overnight. The best part is that she would have been absolutely mortified at the attention and compliments she’s received over the last 130 years – but I think she would be quite satisfied in the nickname often ascribed to her: The Little Flower. Confidence enough to be absolutely content in Christ’s love for her, humility enough to make small sacrifices for the good of others, stubbornness enough to refuse to be turned away from the vocation to which God called her, and joy enough to count herself among the violets and daisies in which God delights – in all of this, St. Therese shows us that faithfulness shows itself not only in grand gestures, but in our small acts of love and gratitude. St. Therese of Lisieux. Story of a Soul The Autobiography of St. Therese of Lisieux (pp. 125-126). ICS Publications. Kindle Edition. Thérèse, de Lisieux. The Story of a Soul (L’Histoire d’une Âme): The Autobiography of St. Thérèse of Lisieux With Additional Writings and Sayings of St. Thérèse . Kindle Edition. St. Therese of Lisieux. Story of a Soul The Autobiography of St. Therese of Lisieux (p. 14). ICS Publications. Kindle Edition.